ACTING President, Constantino Chiwenga has assured Zimbabweans the country's economy was on the mend adding that the current hardships faced by the majority will soon be a thing of the past. Speaking at the Family of God Church (FOG) organised "National Thanksgiving and Dedication service" in Bulawayo on Sunday, Chiwenga acknowledged the current economic crisis but remained steadfast things will normalise sooner rather than later. "Our nation is going through a difficult patch. We need to bring a turnaround in the fortunes of our nation. We are confident that our economy is on the path to recovery. "Things will start to look up in the coming months," he said. 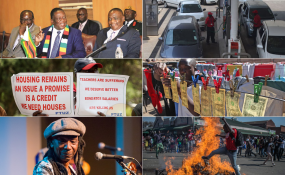 Chiwenga, who is substantive Vice President, said the country was destined for prosperity despite "prophets of doom" he accused of throwing spanners in the wake of the Zanu PF led government's efforts to bring the economy back on the rails. "We are a hard-working people, thanks to the discipline and the work ethic of our nation. We will prosper in spite of those who want to see us down," he said. "Today we look with absolute horror at greedy individuals who masquerade as self-anointed bishops, pastors, priests or evangelists. They feed fat on filthy lucre, all gotten in the name of our God. Is it godly to take advantage of the poor believers and the sickly?" he said. The Acting President also bemoaned endeless internal fights within some local churches. "Lately, we have witnessed quite unusual tussles in some churches. We have seen men and women of the cloth grabbing one another by the collar, calling each other names and throwing pieces of furniture at each other in the House of God. What an abomination and when this happens in our churches who then sutures rifts in the secular world," he said.